Hermann Abert's classic biography, first published in German more than eighty years ago and itself based on the definitive mid-nineteenth century study by Otto Jahn, remains the most informed and substantial biography of Mozart in any language. 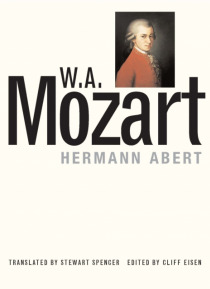 The book is both the fullest account of the composer's life and a deeply skilled analysis of his music.Proceeding chronologically from 1756 to 1791, the bo… ok interrogates every aspect of Mozart's life, influences, and experience; his personality; his religious and secular dimensions; and the social context of the time. In "e;a book within a book,"e; Abert also provides close scrutiny of the music, including the operas, orchestral work, symphonies and piano concertos, church music and cantatas, and compositions for solo instruments.While the tone of Abert's great work is expertly rendered by Stewart Spencer, developments in Mozart scholarship since the last German edition are signaled by the Mozart scholar, Cliff Eisen, in careful annotations on every page. Supported by a�host of leading Mozart scholars, this immense undertaking at last permits English-language readers access to the most important single source on the life of this great composer.